More low-down bar than East Side chic, but in a century-old building. Henry’s. Photo by Michael Horne. With a canopied entrance on a side street, potted plants abloom, abundant outdoor seating and its name painted in fancy letters on a plate glass storefront window, Henry’s on Belleview looks like a quaint bistro from the outside. However, the chalkboard sign in front affirms that looks can be deceiving. “50 cent wings $3 PBR & Schlitz Tall Boys,” it reads. That’s not bistro talk. That’s bar talk. Time to examine this East Side outlier just a block away from the definitely bistro Cafe Hollander and the restauranty Bel Air Cantina. Downer Theater. Photo by Michael Horne. In a minute we’ll head into this tiny little place at 2523 E. Belleview Pl., immediately to the west of, and in the same building complex as Pizza Man, the Downer Theater, Boswell Bookstore, and thousands of square feet of vacant retail space, including the former 5,453 square foot Chancery restaurant. But first, let’s get our historical bearings. Henry’s is in the original, north section of the building, which expanded to the south over the years. Its 1,232-square-foot space was originally two separate stores, as can be seen from the original entry, with quarry tile set in a concrete stoop. The building was designed in 1916 by architect Martin Tullgren at some point before his buildings assumed the Deco/International Style idiom. Check out the Sullivanesque detailing above the entrance to the apartments, separating this place from the fabulously remodelled Pizza Man. The structure was built at a cost of $55,000 for Neacy Read Investments. The firm also owned the Milwaukee Savings and Investment Co., which subdivided the property. Thomas J. Neacy was the Vice President of Wisconsin Compressed Air House Cleaning Company (!) which was a side job from his regular gig as President of Milwaukee Valve. The Read family was involved with the Filer & Stowell Co.
As early as 1894 the Milwaukee & Whitefish Bay Railway Company’s streetcars went past the place, although the neighborhood was largely vacant lots well into the 1910’s. The big draw of the building was to be the Downer Theater. It is the oldest known theater still operating in the City of Milwaukee. Built more than twelve years before the advent of “talking pictures,” the theater is one of the few in the metropolitan area that made the transition from silent pictures to sound pictures. This structure is a fine example of a WWI period commercial building. In addition to the motion picture house, the structure was built with six stores and eight apartments above. The stores held a number of uses, including ice cream shop, bookshop, and other small retail uses that would appeal to streetcar commuters and regular motion picture attendees. In 1930, Benjamin Celichowski sold meat from the east half of what is now Henry’s, while Samuel Stern, a tailor, labored in the west half. By 1950 the butcher shop was in for a long run as Belleview Market Meats, with the Jeannette Schaefer Book Store taking over the tailor’s space. By 1970, the meat market was gone, while the book shop survived. 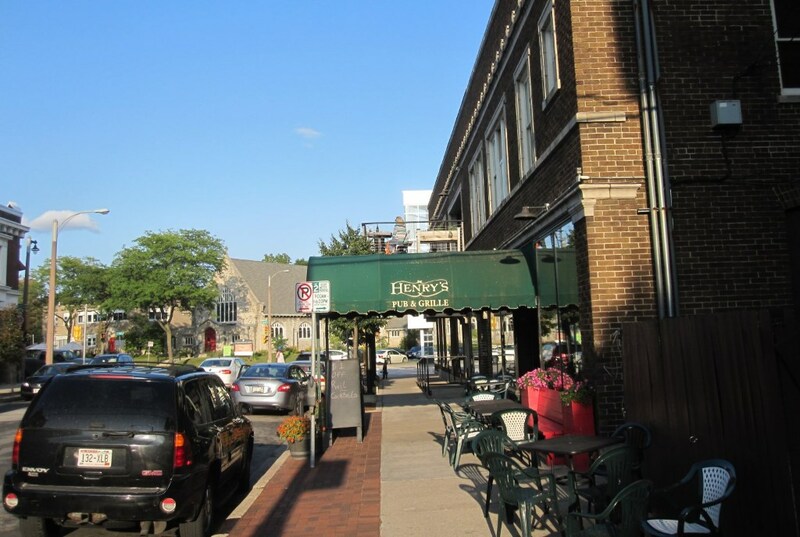 It wasn’t until 1992 that the space was converted into a restaurant when Anna Marie Brennan opened Cafe DiSalvo here. 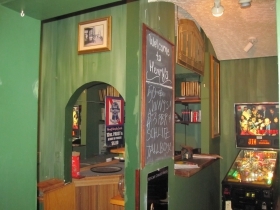 If you look up at the coved, flocked ceiling of Henry’s bar you can see a remnant of that renovation, now an accumulation of tables and chairs accented with a Sopranos pinball machine and a Ms. Pac Man game. The window is curtained off against the street. 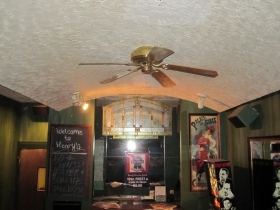 A banner advertises “Henry’s Everday Special” — a 12 ounce Pabst and a shot of Powers: $6. Any resemblance to a bistro by this point is purely a hallucination, and we’re not even in the old butcher shop part yet, and that’s where the action is. Henry’s did not start out here. It originated in 1982 as a component of the Coffee Trader, an innovative retail outlet that prefigured today’s modern coffee shop. The airy, open space included such novelties as Milwaukee’s first espresso machine, which made the trip with Henry’s to this space when the Coffee Trader closed in 1998. The device, unused, serves a decorative function, as does a barrel stamped with the Powers logo. The walls are panelled and painted in green. A “N. Downer Av.” street sign found its way here from somewhere near, and a couple of other things spice up the walls, including a commercial mirror advertising a Bette Davis movie, and some hand-painted murals. 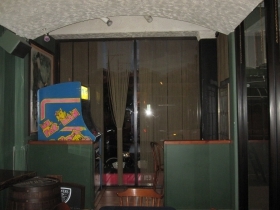 This is a place to sit and play board games, or darts if you are so inclined. The floor is a combination of original butcher shop maple and modern glazed tile. 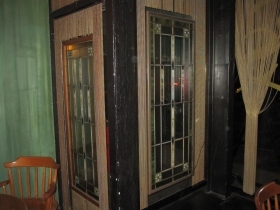 The bar has a brass footrail, and there are stained glass panels hanging on the windows and walls. Door for bartender access. Photo by Michael Horne. 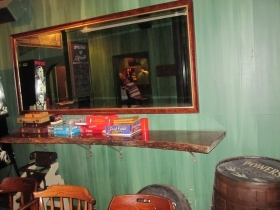 The bar itself is the cutest little thing, with a door for the bartender to access the space from the room next door. It’s the sort of thing you’d see in a stage set. Behind the bar are bottles of brightly lit spirits, which are used to refresh the mood of the patrons, who may also be described as brightly lit spirits. Bar Dice, the game, is not unknown. Try shaking for a shot at a bistro some time. This is a conversational bar. Although there is a television in the room, nobody’s paying attention right now. It is a pleasantly intimate place, frequented by locals. The bars of North Avenue seem miles, not blocks away. 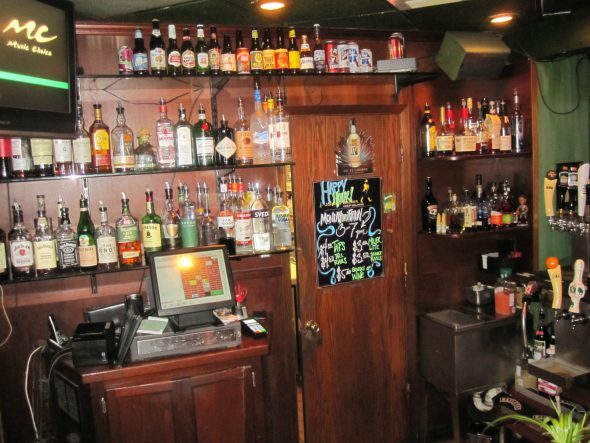 Despite being one of the taverns nearest to UW-Milwaukee, this is not a “college bar.” It is a college educated bar. Due to geography, this is one of the last redoubts to get a drink on the Upper East Side. To the east lies the mansion district, and to the north Shorewood and the suburbs promote their own sort of domestic regularity that frowns on drinking holes. It’s the East Side equivalent of the “Last Chance Saloon” you encounter before entering a Dry County in the South, but far mote literate and congenial. If you want to make an East Side circuit out of it, a trip to Henry’s would mesh seamlessly with a stop at Axel’s followed by a visit to Champion’s. In 2007 David Boxer, an attorney who opened Henry’s partly as a community service, decided to retire from the business. The bar closed briefly, but was reopened in short order after bartender Nader Pakroo worked with a three local investors, John Roush, Christen Pechman and Christian Bartley, to save the place. 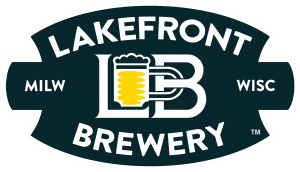 Pakroo remains the tavern’s agent, while Roush and Pechman are now listed as co-owners (each owing 50%), but both now have out-of-town addresses. Of the 48,644 square feet of rentable area in the building complex, Henry’s pays the highest per-square foot rent, estimated by the City Assessor at $22.55/s.f. per year for its 1,232 square foot space ($27,782). The Starbucks Coffee is second, at $22.00 per square foot per year. 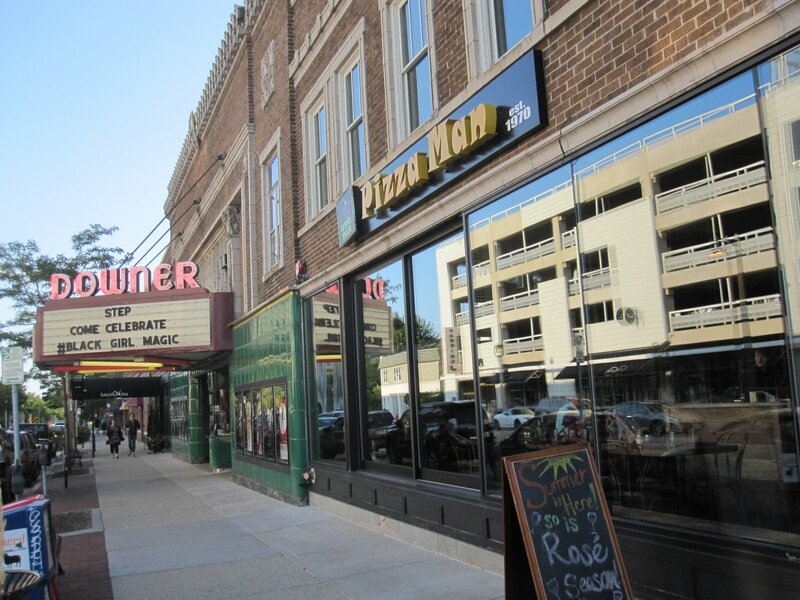 By contrast, the Downer Theater pays $10.28 per square foot, or $80,192 per year rent for its 7,800-square-foot space. Year Building Constructed: 1916. Martin Tullgren, architect. Multi-use building has Downer Theater, apartments and retail. Building Owner: CSFB 2006-C4 N DOWNER AVE LLC-III ASSET MGMT LLC, Irving, Texas. Estimated Annual Rent: 1,232 square foot tavern @ $22.55 per square foot = $27,782.00 per annum according to Assessor’s calculations. Michael, I’d like to repeat a post I made a couple of days ago. Best Hamburger in Milwaukee is served here. Ah, The Tuxedo. As fine an East Side bistro as there ever was. What great memories! Great article, Michael, about a truly great neighborhood pub! I also agree with Jeffrey, even though this place is small, their menu is pretty darn good! And, I can’t compliment the staff enough, great team! Loved the article Michael; will try the burger sometime soon. Thank you. Wasn’t this originally owned (at the Coffee Trader location) by Henry Jones? 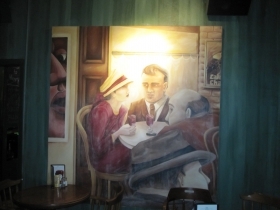 I’ve been to many a literary discussion at Henry’s, although now students seem to favor football games there. Thanks for the article, Michael Horne! The Tuxedo! Now there was a college bar, though I never went there while I attended UWM, because I wasn’t 21. It was in the 2600 block of Downer, on the west side of the street, but I don’t remember the address so I don’t know what’s on its site now.